This cake from Lorraine Pascale is really is a show stopper and it got a lot of ooohs and aaaahs and “hey this really tastes like Mojito!” reactions. Don’t be daunted by the length of the recipe, none of the stages are very difficult to make, you just need time and a lot of it to boil the syrup, make the caramel, bake the cake, make the icing and assemble it all. But you can do it throughout the day in different stages and in between other tasks so don’t hesitate to give it a go. You can easily make this cake one day in advance and it will serve 8 to 10 people. You can easily do this a day or even a week before you make the rest of the cake. This recipe is enough caramel for 2 cakes, so I just store the rest in an airtight container on the cupboard so I have it at hand for my next cake! If you’re a bit afraid of making caramel, here’s a video demonstration that will help you along. First oil a baking tray or line it with a baking sheet. Put 200 g sugar in a medium-size pan over a medium-high heat and leave to melt. Most recipes will tell you to start at a low heat, but I just don’t have the patience for that. Don’t stir it, if it doesn’t melt evenly, just swirl the pan to move the sugar round. Once the sugar is melted, bring the mixture to the boil and cook for 1 minute making sure it does not burn. Add 200 g pecan nuts, swirl the pan to coat them a bit in the sugar and poor on a baking tray covered with a baking sheet. Leave to cool. Once this has cooled right down, blitz the praline in an electric mixer or put in a plastic bag, smash it with a rolling pin and think of your boss. Again you can do this well in advance. I make the syrup in the morning when I assemble the cake at night so you can allow the flavours to infuse. Put 150 g soft light brown sugar, 40 ml water, the juice of 2 limes (zest them first, you need the zest as well) and 80 ml white rum in a medium pan over a low heat. Cook until the sugar dissolves, then boil for 2-3 minutes until the syrup thickens. Add a bunch of fresh chopped mint leaves and the lime zest and set aside. Preheat the oven to 200°C. Grease a 20 cm round cake tin and line the base with baking paper. Fill a large saucepan around a third full of water. Place over a high heat and bring to the boil, then remove from the heat. Set a large heatproof bowl over the pan, making sure the base isn’t touching the water (bain marie). Add 260 g sugar and 6 lightly beaten eggs to the bowl and whisk. This causes them to foam up and gives a lighter, fluffier cake. The egg mixture should be whisked for about 10 minutes, then remove the bowl from the pan and continue to whisk for a further 5 minutes. The mixture is ready when it holds itself well in the bowl and, if you take a spoonful and then drop it back in, the resulting “blob” should take 3-4 seconds to blend back into the mixture. This cake uses no chemical raising agent. Needless to say, for this cake to work it needs the living daylights whisked out of it. Once you have reached this “ribbon stage”, pour the melted butter into the bowl, around the sides (pouring it into the middle knocks out all the air). Fold 115 g melted butter into the egg mix, moving the bowl around and scooping down to the bottom to fold the mixture over itself, using as few movements as possible to retain the air. Next, add 260 g plain flour and fold it until the mixture is uniform and smooth. Pour gently into the prepared tin and bake in the centre of the oven for about 30-35 minutes or longer until the sponge springs back when pushed lightly and a skewer inserted into the middle of the cake comes out clean. Leave to cool for 10 minutes or so, then remove from the tin and place on a wire rack to cool completely. Once it’s cool, slice the cake in half horizontally and set aside. Put 100 g softened butter, 200 g icing sugar and the seeds of 1 vanilla pod (or 2 drops of vanilla extract) in a bowl and whisk until pale and fluffy. Add the zest and juice of 1 lime. Put a dollop if buttercream on a serving plate (to stop the sponge sliding around the plate), place the bottom of the sponge on the plate and brush with half of the reserved sugar syrup. Put a big dollop of buttercream on top and, using a palette or big knife, spread the buttercream over the cake until it is level. Take the top half of the cake, turn cut side up and brush with the rest of the sugar syrup. Turn it back over and put it on top of the buttercreamed sponge. Next, cover the whole cake with the buttercream, including the top and sides, making sure it is a smooth as possible with straight sides and top. Put the cake in the fridge for 10 minutes or so to firm up a little. Use the pecan caramel pieces to coat the sides of the cake. 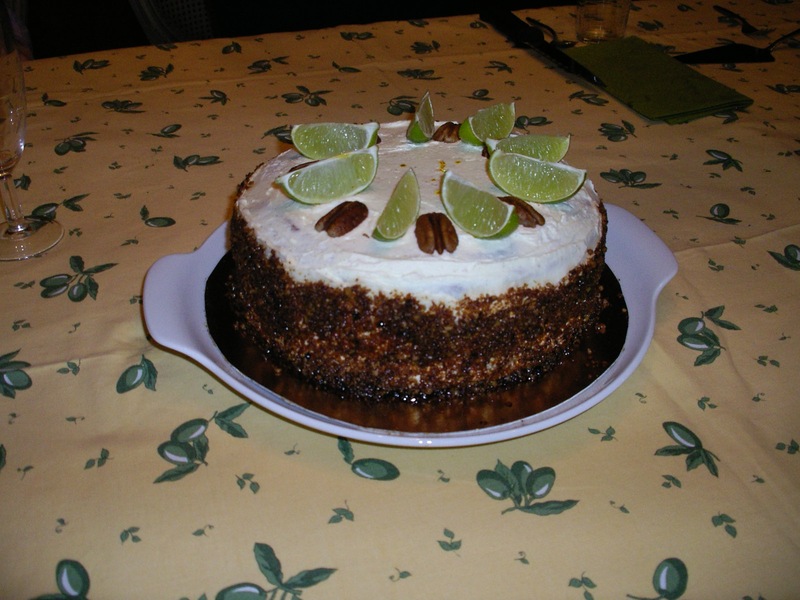 Decorate with limes and whole pecans, if you like. And now make a grand entrance with your cake (and say “ta-dah” for extra effect), works every time! For my birthday at the end of June, I’ll try some variations (same base, other cocktails) so keep an eye on this blog to see how that went!